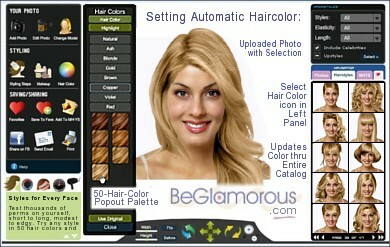 Change Hair Color Online - Upload Your Photo - Virtual Hair Color Ideas, Hairstyles and Highlights. When you need the right look in a hurry, you can also save time with the Personalized Wizard, which suggests hairstyles and colors based on your facial shape, eye color, skin tone and other unique characteristics -- it's available anytime under the "Consultations" tab. There's also Customized Search; just click the "Advanced" button, select Men's or Women's, and type in the sort of style you'd like to find (bangs, Emo, retro...) or the name of a celebrity whose hairstyles you want to try. The Online Hairstyle Selector offers many ways to find your perfect hairstyle and color! When you actually try hair colors online on your photo, it helps answer the question, "What's the best hair color for me?" Have you ever wondered, "what's the best hairstyle for my facial shape?" The Selector can help here, too, whether your face is square, rectangular, triangle/triangular, skinny/slim/slender/narrow or oblong, round, fat, wide, oval, diamond or heart-shaped. 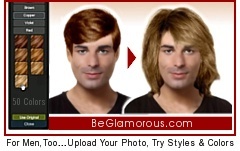 This online hair color changer is brimming with 4000+ women's and men's hairstyles. Looks include short, medium, long, straight, wavy, curly, layered, prom, corporate business, professional, office & work hairstyles, bridal, wedding & bridesmaid, modern or retro-vintage-classic, celebrity hair ideas, fashion, beauty, trendy, pixie hairstyles, upstyles & semi-upstyles (hairstyles half up, half down), styles for Quinceaera, hair cuts for Asian, Indian, Black/African-American women & men, Hollywood hairstyles; hairstyles for fall-autumn, winter, spring, summer; urban, romantic hairstyles, evening hair (or "evening hairstyles"); bangs that are sideswept, front, heavy-blunt, feathered, or side bangs; close-cropped, ultra-straight, current, cute hair looks, formal, holiday or birthday party hairstyles, boho, tousled, simple styles, pretty, messy updo, upswept, girly, glam rockstar, for different types of foreheads (wide, tall, high, low, etc.) You'll find hairstyles for all ages, lifestyles and attitudes! The Hairstyle Selector app offers women's and men's perms of all types, textures and lengths, for all occasions - everything from Wall Street banker to absolutely wild - plus 50 hair colors and over 30 highlight hues. The Hair Color Chart (or Hair Color Palette) is accessed in the left control panel. On the internet, it is frequently asked, "where can you change your hair color online," or "how can I change my hair color virtually," or "what's the best hair color for me / my skin tone / complexion / eye color," or the simple query, "I want to change my hair color." The Hairstyle Selector website makes choosing a color easy and fun - and opens up countless possibilities with the picture you upload for instant color comparison. However you spell it - "hair colors" or "hair colours," this online software program is amazing (you can do basic editing on your uploaded photo to prepare it for usage. It offers flattering haircuts & hairstyles for all ages: hairstyles for middle-age or older women & men, men & women over 50 (or 30, 40, 60, 70...), and looks suitable for kids'/children's use. 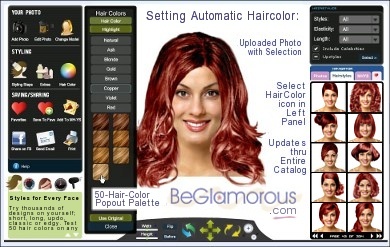 This interactive hair coloring table includes hues known by names such as: Brown (Caramel, Mahogany, Cinnamon, Bronze, Chestnut, Mocha, Hazelnut, etc. ), Blond/Blonde (Platinum, Sandy, etc. ), Gold/Golden, Gray/Grey, Violet/Purple, Red/Reddish (Burgundy, Ginger, Ruby, Mahogany, etc. ), Black/Brunette, Auburn, Ash, Autumn, Copper -- in tones ranging from Light to Medium to Dark. Used with your favorite hair styles, it may be helpful in visualzing the effects or results with hair products such as natural human or synthetic wigs, or weaves; or temporary, permanent or semi/non-permanent dyes, or cremes, shampoos and nourishing conditioners or after tinting or dying, using products such as Majirel, Garnier Nutrisse, Wella Koleston Perfect, Dark and Lovely (or Dark n Lovely), Schwarzkopf Igora, Live XXL, Fudge, Indola, Clynol, XP 100, Daniel Field, Infiniti, PPS, Loreal Feria, Pravana, Jazzing, Keune, Framesi, Alter Ego, Chi Ionic, Alfaparf, Miss Clairol Professional, Goldwell, Joico, Satin, Nice and Easy, Remy, Tigi, Naturtint, Scruples, Salon, Iso, Preference, Paul Mitchell, Logics DNA, Milky Way, Adore, Henna, Nice and Easy Perfect 10 (or Nice n Easy), Herbatint or Dikson; for skin tones and complexions ranging from warm to cool, dark to fair (all brand names and trademarks are the properties of their respective owners). The site does not offer services such as free games or downloads). If you wonder "what would I look like with a new hair color," or just how to change hair color online, the virtual hair color chart (or gallery, changer, selector tool, chooser, picker, visualizer, planner, simulator) lets you compare hair colors online or hair ideas you like, stay in tune with trends, and see yourself with different hair color, online.